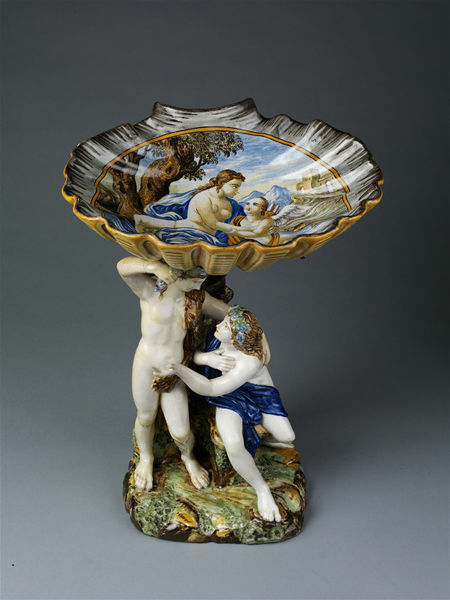 Centrepiece, in the form of a shell supported by a tree-trunk, in front are figures of Bacchus and Ariadne, the former standing, the latter seated. Painted in blue, yellow, brownish orange, pale olive green, grey and dark manganese purple. Inside the shell, in a panel, Venus sitting by a stream with her arms round Cupid who stands beside her. Purchase price note: Bought for £9 9s. 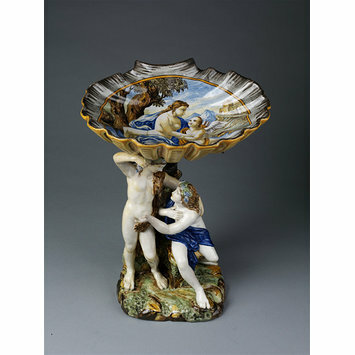 A similar group (without the dish) in possession of Signore Luciano Agorli of Milan, 1959 (Photo in Dep), together with another and probably earlier group of Pan leading a youth to play the syrinse.